Believe it or not, during the month of November, we didn’t go camping! 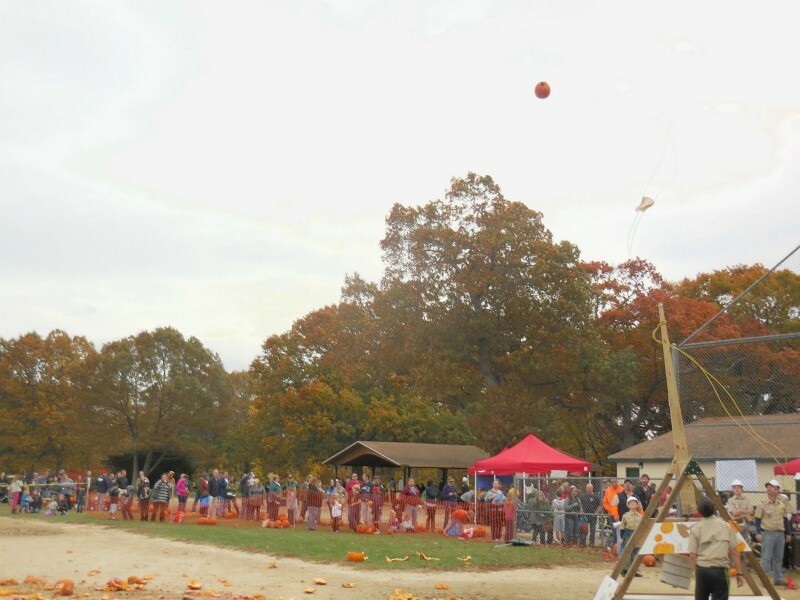 However, we still had a lot of fun with our huge Punkin Chunkin event on November 1st at Pageant Field. We had a huge turnout for the event, and we launched over 200 pumpkins! Some pumpkins went over 100 feet and the mess was pretty epic. Thank you to everyone who came out to support us, and YES, we are going to do it again next year! I am already working on the design for a more powerful trebuchet and we are also going to add some sort of giant slingshot too. We should be able to make the line move much faster next year! Our ‘Treats for Troops’ table also collected over 200 pounds of unwanted candy and donated it to CarePacks.org who will make sure that it reaches members of our armed services overseas. All in all, it was a great day and all of the proceeds are going directly to help the scouts of Troop 6. Thank you!!! The Troop also participated in the Veterans Day activities and it was a joy to see so many veterans being honored, despite the nasty weather. Next up, we are going to be joining the Friends of the Blue Hills for some trail maintenance and then camping over at Camp Sayre in Milton. We will be working on our ax and saw skills and hopefully finishing off a bunch of the last requirements to get the scouts to their next ranks. The rest of the month will be dedicated to advancement and finishing up some of the merit badges we been working on. Our next bottle drive is December 12th from 9-12 in Labrecque Field parking lot and during this bottle drive we will be also be collecting non-perishable food for local food pantries – please consider dropping by even if you don’t have any bottles! Please feel free to call if you need a pick up!